(Parents, Friends, and Families of Lesbians and Gays). We are committed to engaging the Butler County community around issues which are important to LGBT Butler County Pennsylvanians, to support one another as we learn to live openly and freely, to advocate for equal rights for all, and to educate those who wish to understand our work and the lives of sexual/gender minority Butler County citizens. All are welcome to join in our meetings and to become part of our work. 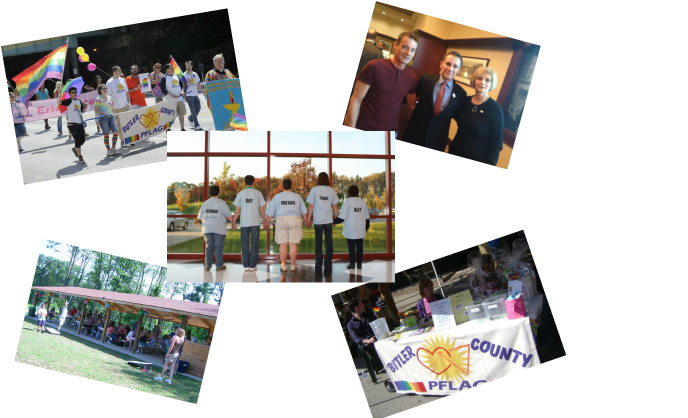 PFLAG Butler County provides opportunity for dialogue about sexual orientation and gender identity, and acts to create a society that is healthy and respectful of human diversity. · Advocacy in our communities to change attitudes and create policies and laws that achieve full equality for people who are LGBTQ.